Aczone is the brand name for the acne-fighting medication dapsone. It is used to treat mild to moderate acne vulgaris. It comes in a gel that you apply directly to your skin. You can use Aczone (dapsone) to treat both facial and body acne. It's especially good for inflammatory acne breakouts, but is also somewhat effective at treating non-inflammatory breakouts like blackheads and milia. Aczone (dapsone) is only available by prescription. Dapsone is an antimicrobial, so it works by reducing the amount of Propionibacteria acnes (the bacteria that cause acne breakouts). So, in this way, it works similarly to topical antibiotics like erythromycin or clindamycin. In fact, Aczone is technically an antibiotic, because the active ingredient in the medication, dapsone, is a sulfone antibiotic. Aczone also reduces inflammation. So, it can help calm down those big, red zits. Aczone can be used alone or along with other topical or oral acne medications. This can help your acne clear faster, and give you better results. Your dermatologist will let you know if this is the best treatment plan for you. Do be aware, though, if you use Aczone along with benzoyl peroxide it can temporarily turn your skin yellow, orange, or brown. Not to worry, this color can typically be washed away. But you'd hate to be out and about before realizing your acne meds have turned your skin a funky color. To prevent this problem, make sure each medication is fully absorbed before applying the other. Or, even better, use benzoyl peroxide in the morning and Aczone at night, or vice versa. Aczone can be used to treat both adult acne and acne in teens 12 and over. Interestingly, in clinical trials, women saw more improvement than men when using this treatment, but it's still an effective option for guys. It's fairly gentle, as far as acne medications go. If topical retinoids (like Retin-A or Differin) are just too much for your skin to handle, making it super dry, red and peeling, Aczone can be a good alternative. It generally isn't as hard on the skin as topical retinoids can be. Aczone is a pregnancy category C drug, which means no good studies have been done and we don't know how it may affect a developing fetus. So, let your dermatologist know if you are pregnant. There are acne treatment medications available that are a better choice to use while pregnant. Also, don't use Aczone if you're breastfeeding. Typically, you'll apply a pea-sized amount over all acne-affected areas twice a day. Massage in gently but completely. It'll absorb fairly quickly. Aczone can be used on the face and neck, as well as chest, back, arms, or wherever acne is a problem. The trick is to apply to the entire area where breakouts are a problem, not just to individual pimples. Also, make sure your skin is cleansed and dried well before applying. Keep using this medication even if you aren't seeing improvement or if new pimples are still forming. It can take up to 12 full weeks before you see real improvement. And, like most acne medications, Aczone doesn't work great for everyone. If you use it for 12 weeks without seeing much improvement, let your dermatologist know. You'll likely be prescribed an additional, or different, acne treatment. Aczone can cause dryness, peeling, and redness of the skin. For some people, it can also make the skin more oily. The most important thing to know, though, is to tell your doctor if you have glucose-6-phosphate dehydrogenase (G6PD) deficiency. Dapsone, when taken orally, can cause hemolytic anemia. It's highly unlikely that the topical form of this medication will have the same effect because your skin simply can't absorb that much medication. Still, you'll want to let your dermatologist know if you have G6PD deficiency, just to make sure. Your dermatologist will let you know if Aczone is the right treatment choice for your acne. If not, though, remember you have plenty of other acne treatment options too. ACZONE Prescribing Information. Irvine, CA: Allergan, Inc; 2015. Alexis AF, Burgess C, Callender VD, et. al. "The Efficacy and Safety of Topical Dapsone Gel 5% for the Treatment of Acne Vulgaris is Adult Females with Skin of Color." Journal of Drugs in Dermatology. 2016 Feb 1; 15(2):197-204. Del Rosso JQ, Kircik L, Gallagher CJ. 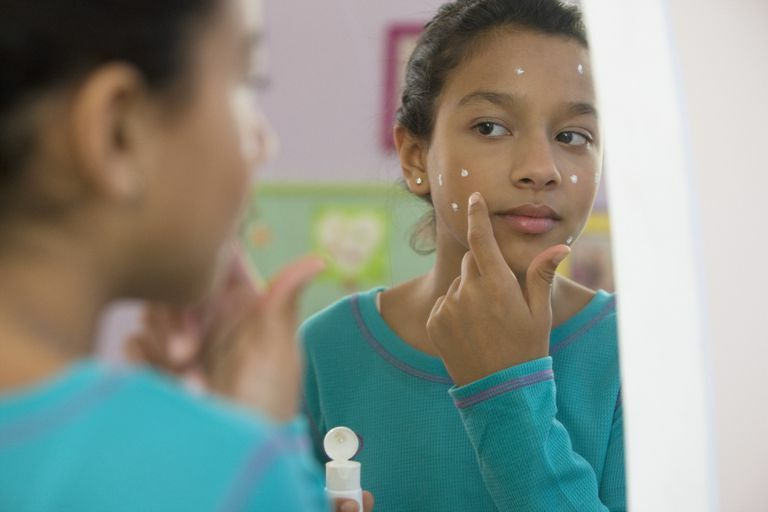 "Comparative Efficacy and Tolerability of Dapsone 5% Gel in Adult Versus Adolescent Females with Acne Vulgaris" Jounral of Clinical an Aesthetic Dermatology. 2015 Jan; 8(1):31-7. Kong YL, Tey Hl. "Treatment of Acne Vulgaris During Pregnancy and Lactation." Drugs. 2013 Jun; 73(8):779-87. How Does Oral Erythromycin Work for Acne? Is Differin the Acne Treatment for You? Is Topical Erythromycin the Right Acne Treatment for You? Is Oral Minocycline the Right Acne Treatment for You? Why Would Someone Treat Their Acne With Sulfur?